Movement, mystique, and sexuality collide in this innovative and compelling work of physical theatre that examines the life of Margaretha Geertruida Zelle MacLeod, otherwise known as the iconic Mata Hari. Mata Hari—a Dutch burlesque dancer during World War I—was accused of being a spy and executed by firing squad. Her sealed trial documents are scheduled to be declassified by the French Army in 2017, exactly 100 years after her execution. 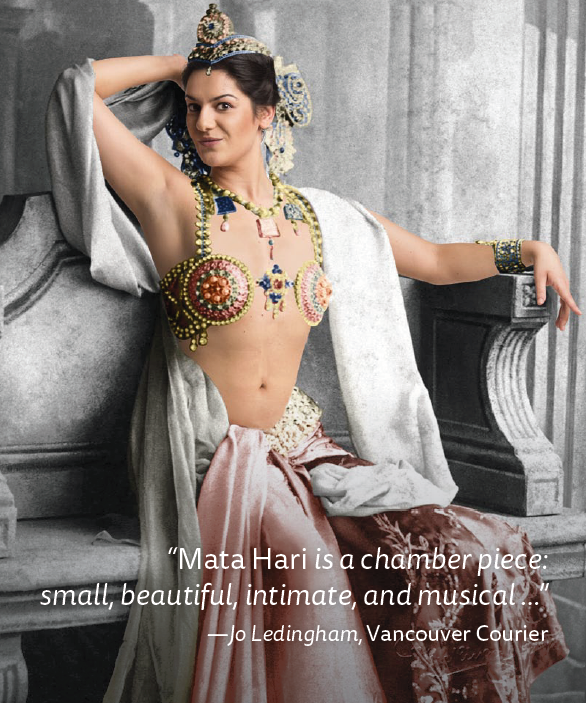 This show investigates Mata Hari’s controversial life using both movement and text, and explores how identity, sexuality, and performance intertwine. The performance includes Indonesian dance theatre and text, much of it Mata Hari’s own words, in French with English subtitles. Single Line Theatre is an independent, forward-thinking arts organization who found its niche at the intersection of theatre and film. The company’s mission is to create thought-provoking work that deeply examines the human condition in its complexities with the goal to better understand our individual and collective selves. Their work is built on values of collaboration, diversity, and artistic excellence.